Farmer of the Year follows the story of 83 year-old Minnesotan farmer, Hap Anderson, who sells the farm he worked his whole life on. Now at a loss, Hap and his brother set out on the road trip of a lifetime in an ancient Winnebago all while Hap questions his purpose and accomplishments along the way. The film stars Barry Corbin (No Country for Old Men, WarGames), Mackinlee Waddell (GCB) and Terry Keiser (Bernie Lomax from Weekend At Bernie’s). 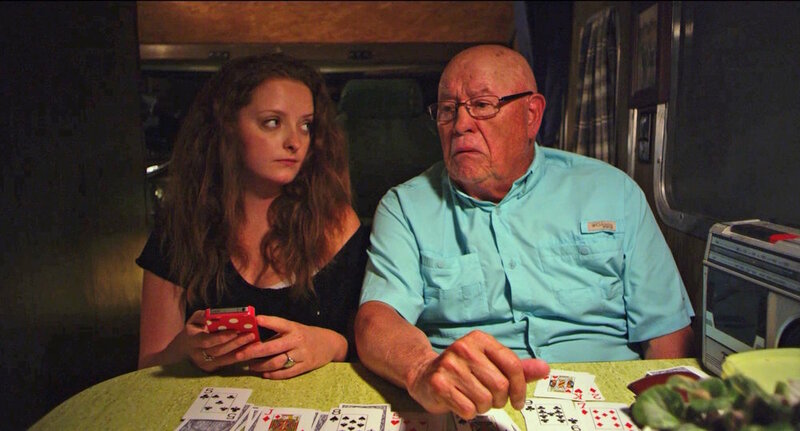 Mackinlee Waddell (Left) and Barry Corbin (Right) in a still from Farmer of the Year. On location of Kathy’s childhood farmhouse. The principal photography for the film was 28 days in the summer of 2016 with four additional days of pickups the following summer when the exteriors all matched the same. An official wrap of production happened after a one-day shoot in January 2018, which was only three weeks before the film’s world premiere at the Sedona International Film Festival. Jacob Midkiff a 2nd Year MFA student (2nd Left) and Megan Fitzgerald a MFA thesis student (Center) sit on location enjoying catering. In the end, Farmer of the Year was finished and on its way to being shown to the public. Kathy and Vince express that, “We want the audience to empathize with the two main characters and to experience a deceptively simple movie that engages serious, universal themes: transition, aging, loss, loneliness. We wanted it to be funny in a human, real-life sort of way. The same with the drama. We want the audience to relate to the characters and feel satisfied when they leave the theater.” To achieve this, they worked endlessly to keep “high production values and score and a project we could be proud of.” Most of all, though, Kathy and Vince want people to enjoy the film. Barry Corbin in the film Farmer of the Year. Kathy and Vince express excitement in response to bringing the film back to their alma mater. “We don't know how many of the crew are still around, but it will be really fun for them to see their hard work up on the big screen. Also, we were in Athens long enough to meet a lot of nonstudent folks and it will be fun for them to see it too. And it will be enlightening for current film students, if they are serious about being filmmakers, to see that making a feature film is possible.” Along with this, they express thanks to Ohio University students, alumni, the Ohio University School of Film for the equipment, and grant funding through a Student Enhancement Award. Additionally, they extend gratitude to “School of Film faculty and filmmaker Tom Hayes...who's editing help was invaluable and Annie Howell, an ex OU faculty member and filmmaker, who was very generous with information and support as well...even after she retired from the program. Kathy (Left) and Vince (Right). Make sure to catch Farmer of the Year this week only at the Athena Cinema, April 16th -18th. And stay after the screening for a talk back with the filmmakers.